Thousands of doctors could face a "career black hole" under a shake-up of NHS training posts, medics say. About 21,000 junior doctors will be competing for 9,500 training posts in England next year. The British Medical Association's annual conference passed an emergency motion calling on the government to delay implementation of their plans. 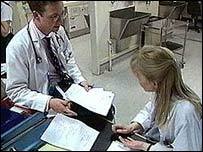 Doctors said junior medics will either be forced abroad or work in posts with no chance of career progression. The government is revamping the training process for doctors by scrapping senior house officer posts. Doctors have traditionally gone through three stages of training - pre-registration house officer, senior house officer and finally specialist registrar. Under the government's plans there are just two training phases - a two-year foundation programme followed by a specialist training programme. The government said the aim was to speed up the training of doctors, but doctors said it may be part of an agenda to restructure the workforce. Doctors who do not get training positions tend to end up in service posts such as staff and associated specialists (SAS) and are used to fill in gaps across departments. The posts offer no opportunity of progressing to become consultants. And as they are paid less than two thirds of what a consultant receives, the move could save the NHS money. Dr Jo Hilborne, chairman of the BMA's junior doctors committee and a specialist registrar in Cardiff, said thousands of junior doctors were facing a "career black hole". "We are incensed at the cavalier way this announcement was made, with no discussion with ourselves. "This will dispose of the careers and aspirations of 11,500 junior doctors. "There is a concern that there is an agenda in the short-term to push lots of these doctors into service posts." BMA chairman James Johnson said if the NHS was to lose doctors it had spent time and money training it would be a "terrible waste". "It is a huge crisis looming and it is completely unacceptable." Health Minister Lord Warner accused doctors of seeking "cheap headlines". "It's absolute rubbish to say there will be thousands of junior doctors without jobs. "Some doctors may have to be flexible, but at the end of the day our changes mean that more doctors will go into specialties where there are shortages and more patients will be treated by trained doctors, meaning that patients benefit." Shadow Health Secretary Andrew Lansley said medical students had been let down by the government. "I repeatedly questioned Labour over their planning failures for the provision of specialist training posts, but they appear to have proceeded without working them out."